My Sky Arts commissioned play on the English Civil War, The Battle of Heptonstall opens on February 28th. Research for the piece led me in a number of directions and recently out of interest rather than necessity, to looking at what happened to English drama in the period and why, considering the magnitude of the historical events, the English Civil War continues to be so seldom dramatised on stage and screen. In 1642 playhouses were closed. They were to stay closed for the next eighteen years though no one foresaw that at the time. There was not one order issued by parliament but rather a series based on reports and complaints and the reasons for the closures changed with the progress of the Civil War. In 1642 it was about the need to pray rather than play. The wording of the order invited the public into common cause with parliament, to set sport and leisure to one side at a moment of unprecedented crisis shortly before the war began. The major concern at the time was invasion by an Irish army. After the rising of 1641 coastal areas were rife with rumours of invasion. London was in political turmoil inside and outside parliament, Christmas of 1641 was punctuated by rioting in Whitehall and the breakdown of links between London and the King. The order of 1642 is passed on 2nd September, the very cusp of war; on the 9th the Earl of Essex takes command of a parliamentary army to confront Charles I. An order of 1647 contrastingly emphasised suppression and punishment of offenders, it gave sheriffs jurisdiction to arrest actors and ‘imprison rogues’. Eventually in 1648, with the puritan revolution in full vigour an order was issued to pull playhouses down. Just as the Civil War had its roots in the years prior so did the suppression of theatre. In 1639 a play was produced in London, The Cardinal’s Conspiracy which satirised the clergy and resulted in the arrest of the actors. If theatre had a side in the period, it was by and large royalist. Imaginative spectacle never sat well in the puritan psyche that in the end banned Christmas and maypoles and had boys whipped for playing football on Sundays. Theatre responded to the suppression by working at the edges and by going underground. Short plays known as ‘drolls’ popped up in taverns on the outskirts of towns. There is evidence from pamphlets that street theatre takes on a new significance whilst mainstream plays that would otherwise be at the Cockpit or the Salisbury Court are performed in private houses. What emerges in 1660 is Restoration drama, defining itself as a rebellion against the interregnum. The best-known fact about the Restoration drama is that it is immoral. The dramatists did not criticize the accepted morality about gambling, drink, love, and pleasure generally, or try, like the dramatists of our own time, to work out their own view of character and conduct. What they did was, according to their respective inclinations, to mock at all restraints. Some were gross, others delicately improper….The dramatists did not merely say anything they liked: they also intended to glory in it and to shock those who did not like it. From George Clark’s The Later Stuarts 1660 – 1714. The new drama is more commercial, playhouses that are built are smaller than those of renaissance theatres and women are not only on stage, they are writing plays. Charles II not only brought an entourage over France he brought cultural influences as well and one of the most successful women playwrights of the Restoration dramatist Susannah Centlivre made a career of adapting French theatre for the English stage. What is there in the way of contemporary drama about the Civil War? By way of the theatre, there is Light Shining in Buckinghamshire by Caryl Churchill (1976). More recently Howard Brenton’s 55 Days. In film, there is a biopic of Cromwell, of Winstanley, and more recently To Kill a King. On television, By the Sword Divided from the early eighties, more recently Peter Flannery’s excellent The Devil’s Whore. There are one or two others perhaps: A Field in England and Witchfinder General which use the war as a back drop but the specific dramas are not that hard to bring to mind. In comparison with the ubiquitous Tudor’s there is relatively little. And yet, more people died per head of the population than in any other war in our history, including the First World War. Ireland suffered a loss of up to 41% of its population. Putting these numbers into the context of other catastrophes helps to understand the devastation to Ireland in particular. The Great Hunger of 1845–1852 resulted in a loss of 16% of the population, while during the Second World War the population of the Soviet Union fell by 16%. Those two events are burned into the psyche of the national narratives, the Civil War is largely absent from England’s. It is admittedly a difficult narrative to dramatise. It’s a complex if not complicated subject. It was not a class war and though the completion of the reformation, it was not protestants versus Catholics either but rather many persuasions of Protestantism against Catholic affectations. Furthermore, it is not a pretty sight, particularly if you’re English. English writers find it easier to write about the Spanish Civil War, a subject best avoided in Spain. Perhaps we want to be reassured by history; that it’s composed of an inevitable continuum that leads to here, the right path. The Civil War was a detour that no one had a map for. The fact that artistic expression during the period was so meagre hasn’t helped subsequent representation. There is Milton of course and there is Andrew Marvell but I know of no outstanding drama and the novel has not yet emerged. 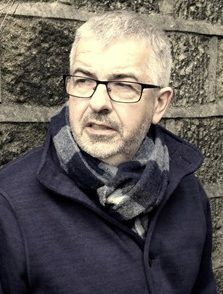 The theatre director Max Stafford Clark said that the closure of theatres during the interregnum created the space for the development of the novel, but Bunyan’s Pilgrim’s Progress is not published until 1678 and Defoe’s Robinson Crusoe is 1719. The novel begins when you can read them. There are few literary and no particular dramatic style from our period that writers can draw from. Colonel Sir Thomas Rainsborough, Leveller and MP for Droitwich, The Putney Debates. I may very well be coming to the end of my residency as a writer at a young offenders’ institution. I’m waiting to hear. For their decision. As with the prisoners I am in the hands of the gods. For the past six months I’ve been cooperating with Julian Armitstead, a writer who was based at HMP Hewell, on a project entitled ‘Oedipus in Jail’. Julian approached me at the end of 2012 suggesting we retell the first part of Sophocles Theban trilogy Oedipus the King but set in a prison. 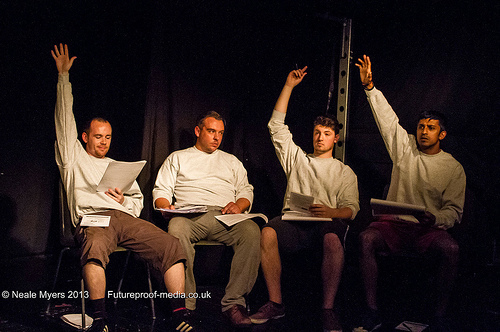 We would develop the script with serving prisoners and possibly even, perform or read it to an audience inside. It was an ambitious idea, some friends and colleagues thought over ambitious, but that was partly why I agreed. Over the last six years at HM YOI Lancaster Farms I have worked with groups of young prisoners (lads) on Othello, Macbeth, Our Country’s Good, Of Mice and Men and watched them recite Auden (his choice not mine) from the stage in the chapel. It was a given to me that despite many lads being culturally impoverished, I could work with them on great literature. Not all of them by any means, not most even, but some lads no question. In my experience they are flattered by my proposal, unfazed and keen to get out of whatever they are pretending to do. There are also in that jail, in any jail, just like Oedipus himself, naturally bright lads. But the major reason why the Oedipus story seemed apposite to explore with prisoners was its enduring narrative and subtext. A mother and father believe their son will come to no good, they are told so by those that know the future, they even try to take his life, but through the intervention of a good shepherd he is adopted across the mountains and grows up believing he is with his natural mother and father. Once he has grown it is again foretold he will bring destruction upon his family, so where does he run to? Back to where he came from, only to clash with his own anonymous father upon a one-way street, killing him before facing down the monster at the gates of Thebes by answering the riddle of the age and entering the city to be crowned and offered the hand in marriage of his own mother. This is just the backstory to Sophocles’ play, the crime that Oedipus sets out to solve in the drama. 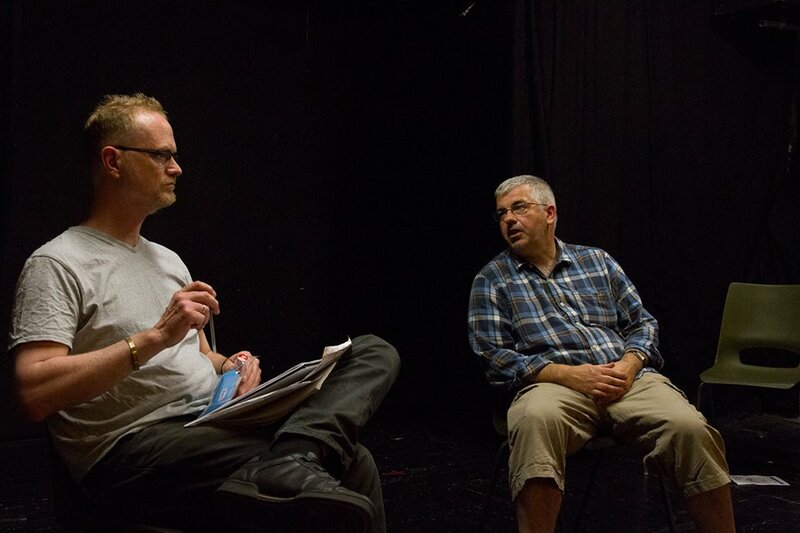 Initially Julian and I were uncertain what we would dramatise, what part of the story and what the involvement of prisoners in the retelling would be. Why would a group of criminals, fictional or otherwise want to stage Oedipus? I thought I’d ask them. I went round classrooms and groups of lads, mostly cleaners on the wings, telling them the narrative and asking who was interested in retelling this story in the context of a jail. What surprised me was how many lads knew something of the story, even when they couldn’t remember where they’d heard it before. I then worked with different groups of up to four lads around the jail discussing why and how a group of prisoners might want to re interpret or interpret a two and a half thousand year old play. Once again my assumptions which I considered freethinking were brought to book. I suggested to a group in a classroom that a fictional group of prisoners might decide to retell it set in a contemporary housing estate and there was immediately some offence in the room. Why wouldn’t they try and do it just like the Greeks? Yeah, why does everything we do have to set on a miserable estate or in gangs? I was reminded that the reason we were doing this, the reason I am there is, the point of drama itself, to help people escape. They say there are seven stories: overcoming the monster, rags to riches, the quest, voyage and return, comedy, tragedy, rebirth. They are all in Oedipus and they are all in us and our fantasies but they are all, especially it seems, in prisons. Every time we discussed the plot someone always digressed to their own life, the life of a co-defendant, another lad on the wing, in love with his step mum, who had killed their father, or just wished they had. Lads that had never met their ‘real dad’ had been put into foster care at an early age and gone looking to no avail or to significant disappointment. ‘Comedy’ by the way isn’t the Jim Carey variety; it’s generally thought to mean the set-up of a misunderstanding that keeps parties apart, more in the Twelfth Night variety. The allegories at Lancaster Farms are comedies that tend to be about who stitched up who and are now on separate wings. We do have Romeo and Juliets and ‘From Getting By to Riches to Rags’. It became apparent that we didn’t need a group of fictional prisoners to dramatise Oedipus the King because he was already there, in the room. His story would be told through the lives of four prisoners, forced to confront their pasts through a victim awareness course. A course that the four characters have to complete if they want any chance of parole and usually the only arena where prisoners are asked to confront what they have done to others. Over the next few months, with the involvement of prisoners at HMP Hewell and Lancaster Farms Julian and I developed four fictional characters, each haunted by some element of Oedipus. They became: McBride, Stretch, Monk and Kasra. They are taught by former drama teacher Helen, and McBride is visited by his wife Lauren and his solicitor Shirley. It was McBride’s story that formed the spine of the plot. He is edging towards parole. He needs it to be with his son. But then, a new witness for an old crime comes forward, implicating him. And he must deal with the witness as well as pass a victim awareness course at the same time. He must do what a lot of prisoners do: face both ways. It doesn’t end well. We put the characters into scene after scene, in conflict with a Governor, with a teacher, with their mothers, fathers, a wife and a son and the law. We got rid of the Governor, changed the gender of the teacher; turned the prisoners against each other and themselves. Every scene was read with groups of prisoners, tested for its authenticity, its power to hold; some were discarded all were rewritten several times until a first draft was completed. 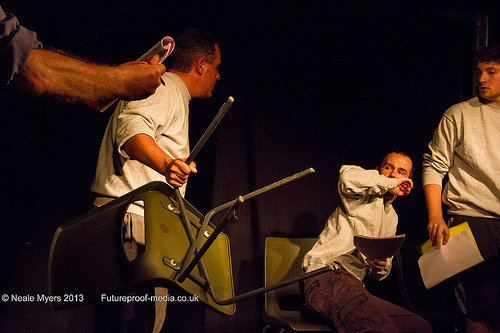 We then work-shopped the script for three days with a group of talented actors before a script in hand performance at this years’ 24:7 Theatre Festival in Manchester. It was well received. There’s another draft out now. Just released. With a London theatre. We hope the gods smile upon us.